UMTS is the wireless network technology behind the rollout of Third Generation (3G) mobile telecoms networks which will bring video, music and internet services to the cellphone and a range of electronic products. Chris Braithwaite and Mike Scott use their extensive experience of training engineers across Europe, and their backgrounds in working with Nokia, Ericsson and Orange to deliver a uniquely practical guide written from the perspective of the engineer and network planner. This guide is a valuable addition to the literature on UMTS which to date has been dominated by theoretical and reference works. 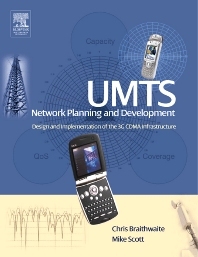 The authors consider each of the key topics of UMTS/WCDMA and 3G rollout in terms of Coverage, Capacity and Quality of Service- the key considerations for all engineers and managers working in 3G telecoms. Mobile Telecommunications engineers and managers:manufacturers, vendors and operators. Network planning engineers and managers, UMTS systems developers, R&D engineers, EE students.